Are You Putting Your Business At Risk With Lawyers Who Don’t Understand Technology Contracts? Discover The Legal “Blind Spots” That “You” As The Business Leader Of Your Organisation Must Know! Don’t Jeopardise Your Business With Bad Legal Advice! If you are a successful senior technology executive, a lot of your time and attention is spent dealing with draft contracts and negotiating a growing stack of commercial contracts. You may think you already have the necessary legal expertise on hand, but you’ll be surprised to learn that many executives are incredibly unprepared when it comes to legal matters. The simple truth is that many CEOs are great at managing day-to-day operations, and yet the cookiecutter legal advice they often rely on can’t spot the potholes and pitfalls that can hide in a technology contract. Without a contract expert on hand, you could be jeopardising the success and profitability of your business. If I were to take a peek at your inbox right now, I wouldn’t be surprised to see communications from outside vendors and your fellow executives on negotiating commercial contracts, along with draft copies of those contracts. Sometimes those contracts are “standard” and sometimes they may have a huge amount of leverage you could use to create significant value for your organization. Many of the deals that come across my desk have gaping holes inside them that the executive didn’t see on his or her own. Sometimes a second opinion from outside the company can make all the difference between exposing your Intellectual Property to significant risk and ensuring its security for the long term. This book exposes some of the myths or what I call “blind spots” that many tech executives don’t always consider when negotiating their deals – things that put them in a less-than-ideal position. I’ve seen many deals go bad, with companies struggling to put themselves back together when all they really needed in the first place was some better advice from an experienced tech lawyer. I decided to write this book to help the industry that has been so good to me over the years… and since I’m a technology guy myself, the more good I can do for the industry, the better for everyone. Alan Arnott is the private legal advisor to senior technology executives who want to improve the commercial, legal and financial success of their organisations. For the last decade, Alan has represented tech suppliers and customers in successful deal negotiations. He has extensive experience drafting, reviewing and negotiating a wide range of legal agreements, in addition to advising clients on legal issues and assisting them with dispute resolution. Alan’s background is in both law and computer science, so he understands the legal and tech challenges that clients encounter and can quickly pinpoint the critical issues in any commercial contract negotiation. If you are a CEO or senior executive, every day you are driving decisions that affect the short- and long-term success of your company. 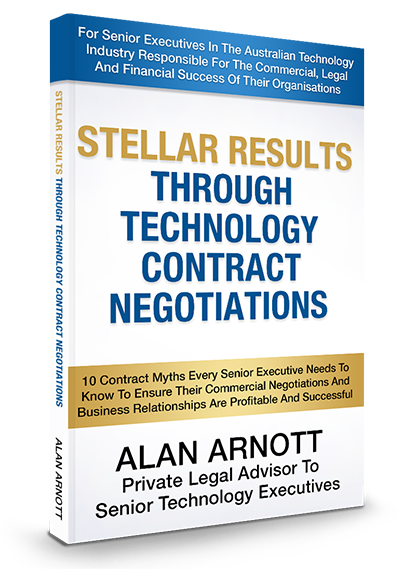 If you are involved in technology contract negotiations, you can’t afford to be without this indispensable book that exposes the 10 legal myths most CEOs fall prey to. I have used Alan’s expertise several times now and have found him to always exceed my expectations. He is an expert in the technology law area and he is great to work with. His flexibility, knowledge, expertise make him a perfect service provider! I highly recommend him. Alan is an excellent, well-rounded commercial and trusted advisor, always willing to go the extra mile to service his clients’ needs. His knowledge of the law is a given, but what sets Alan apart is his ability to establish the issues at hand and provide solutions that are both commercial and practical. I’d recommend Alan to anyone.